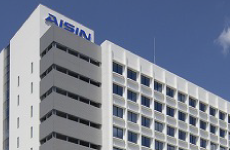 AISIN COSMOS R&D CO.,LTD. was established as one of the incorporated research agencies of AISIN SEIKI with the vision of “Contributing to a prosperous future”. Since establishment in 1992, we have been working on the “Energy, Electronics, Bio and Medical” technology fields as our future agenda and which we have at the center of our research and development. In recent years, the weight of energy and environmental problems has increased due to sudden increase in development and population growth in developing nations including Asian countries. We have been paying a high price for the pursuit of comfort. That high price is namely“environmental destruction”. However, in the coming years, it’s time to achieve a good balance between comfort and environmental protection and only then will “safety” be assured for our children. To achieve this, what we need is “high technology” and also each and every research worker’s consciousness. With this awareness and our energy, sensing, bio and chemical technology, we contribute to sustainable development of a “CO2-free” and “Safe, secure and healthy” world.